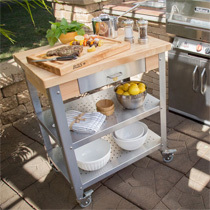 A full range of kitchen carts, kitchen islands, butcher block kitchen islands, kitchen utility carts, stainless steel kitchen carts, kitchen worktables, microwave carts, trolleys by catskill, home styles, john boos & more. 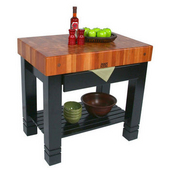 Find the perfect kitchen island or kitchen cart for your home. Kitchen Islands and Kitchen Carts provide extra workspace and storage space while creating a centerpiece and focus. Available in a variety of sizes, finishes, and styles, kitchen islands and carts come with an array of features, including drawers, open or enclosed storage, storage hooks, drop-leaves and wine racks. 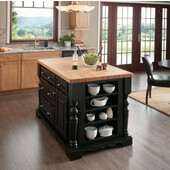 Butcher block islands and carts add a professional element with solid wood tops and an ideal food prep surface. 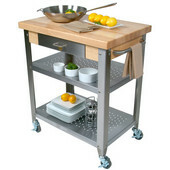 Stationary kitchen islands offer a stable work area, while mobile kitchen carts give you freedom of movement. 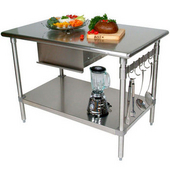 Stainless steel top kitchen carts and kitchen islands add a modern look to your kitchen. A granite top kitchen island or kitchen cart adds texture and color. 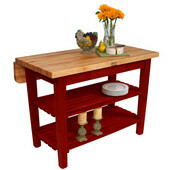 KitchenSource.com strives to bring you the widest selection of Kitchen Islands, Butcher Block and kitchen carts available anywhere. Remember FREE SHIPPING IS AVAILABLE on all islands, carts and butcher blocks. John Boos has been making quality butcher block products since 1887. John Boos kitchen carts, kitchen islands and workstations are available in a wide variety of styles and sizes to furnish residential and commercial kitchens. Cucina Americana Worktables and Cucina Americana Commercial Worktables are made of food service stainless steel and hard rock Maple. The Butcher Blocks feature end grain Maple or American Cherry tops in varying thicknesses. American Heritage workstations and kitchen islands have end grain maple tops and solid wood bases that are available in an array of colors.